Qmotion UK shades are available to buy through an exclusive network of Authorised Resellers based throughout the United Kingdom, The Republic of Ireland and many other worldwide based specialist Integrating companies. If you would like to know where you can buy QMotion UK Shades from please contact us and we will put you in touch with your nearest QMotion UK Authorised Reseller. All our QMotion UK Authorised Resellers are specially selected for their knowledge and experience of managing and installing window treatment shades and systems by which they operate. They will be able to meet and discuss your requirements and advise on fabric selection and the correct window treatment design to suit the windows to which they are intended to be used. They will also brief you on what control options are available to you and again advise on what best control system will suit your requirements. Finally they will be able to provide a professional measure and installation service to complete your QMotion product placement at your window. 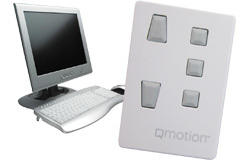 QMotion UK, 35 Alston Drive, Bradwell Abbey, Milton Keynes, MK13 9HA, United Kingdom. Interested in becoming a QMotion Authorised Reseller? If you are interested in becoming a QMotion UK Authorised Reseller let us know by completing some brief details below and emailing it to us. We will then contact you to discuss your details and if applicable send you a full application form. QMotion UK supply some of the most technically advanced and innovative window treatments available in the market today if you would like to become part of our success please contact us now.